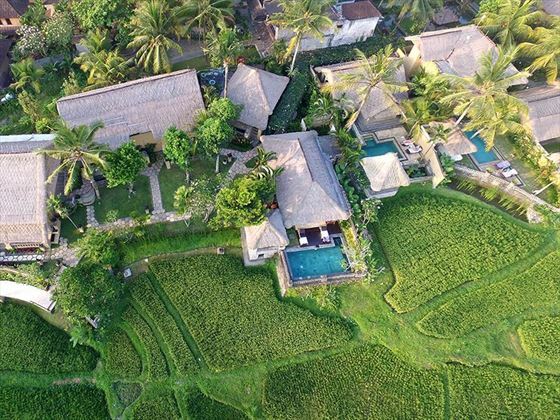 Adorned by picturesque rice fields and luscious tropical gardens, Wapa Di Ume is a hidden oasis of peace and tranquillity, whilst being located just a few minutes away from the artistic and cultural haven of Ubud. The resort seamlessly blends Bali’s natural beauty with gorgeous textures and colours inspired by your surroundings, from smooth, unpainted woods and fragrant alang-alang grass roofing, to natural bamboo décor, rough cut stone and soft, homespun fabrics. The accommodation consists of sixteen stand-alone properties scattered along the gentle hillside, flanked by verdant flora and serene rice fields for a complete feeling of privacy and seclusion. Each room and suite features a four-poster king bed, a private furnished balcony and luxurious en-suite bathroom with a sunken tub, garden views and a glass walk-in shower, whilst the villas also showcase a luxuriant infinity-edge pool, garden courtyard and a separate living room area. 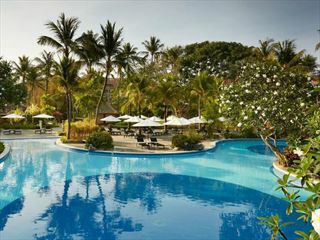 Throughout the resort property, you’ll find a wonderful selection of amenities, including a beautiful infinity-edge pool with striking views over the rice fields, a luxuriant rainforest spa, outdoor yoga studio, and modern fitness centre, and two superb restaurants serving a mouth-watering fusion of authentic Balinese cuisine and western favourites. 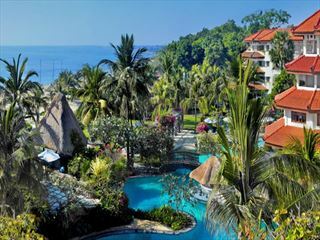 We love the selection of activities on offer too, from Balinese Cooking Classes to Rice Paddy Trekking and Palm Leaf Creation demonstrations. 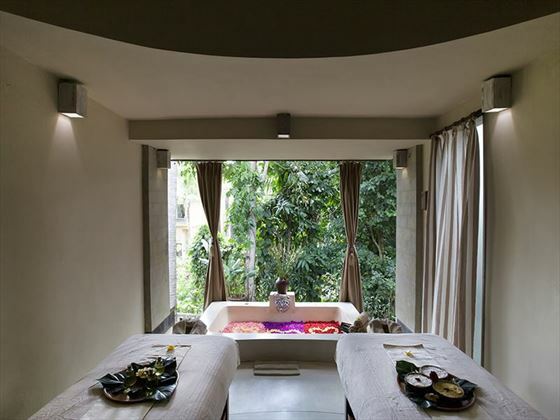 Located only minutes from the hustle and bustle of Ubud, Bali’s cultural and artistic heart, Wapa Di Ume is hidden within luscious rice fields and stunning rainforest scenery, providing a haven of peace and serenity. 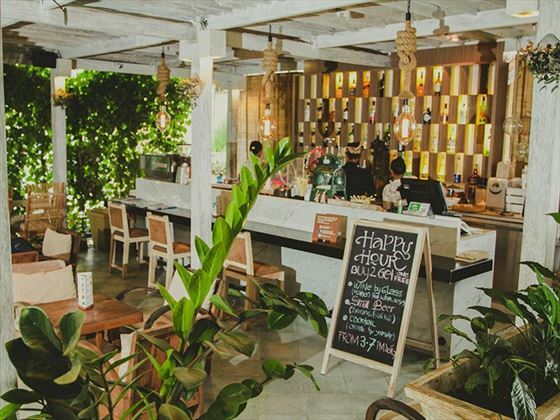 Within a 10-minute drive of the resort, you’ll find an abundance of popular Ubud attractions including the bustling central market and Ubud Palace, in addition to a number of museums, galleries, restaurants, cafes, and fascinating ancient temples. Just a little further out, you’ll also find the famous Sacred Monkey Forest and Tjampuhan’s Sacred Hills. Lanai Room Set on the ground floor, these beautifully-appointed and rustic 42sqm rooms feature stunning views of the rice fields and lush, tropical gardens. Accommodates up to two adults. Di Ume Suite Airy and modern with island-inspired décor, these spacious 60sqm suites boast spectacular panoramas of luscious agricultural scenery from a prime second-floor location. Accommodates up to two adults. 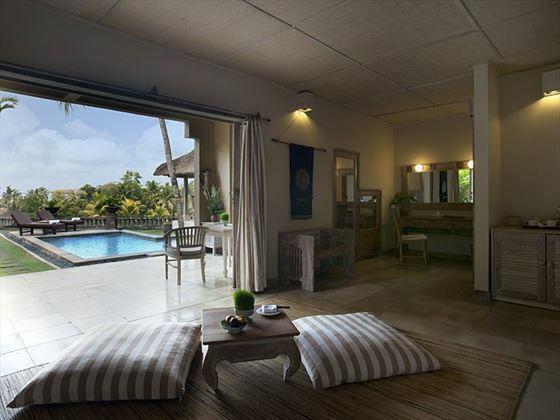 Villa with Pool These luxurious, serene stand-alone 144sqm villas overlook stunning views of the rice fields or luscious gardens. 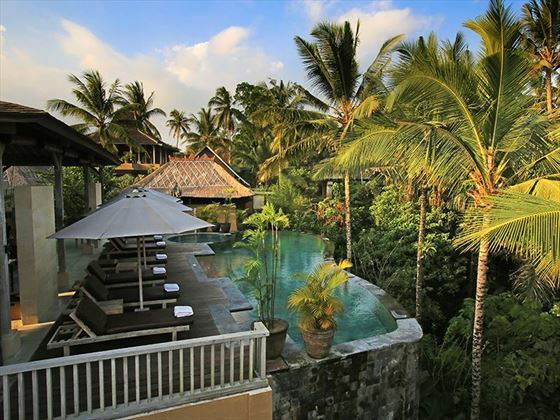 A gorgeous private garden courtyard features a large plunge pool, plush sun loungers and a Balinese sala. Accommodates up to two adults. Terrace Villa with Pool These sumptuous 144sqm stand-alone villa properties boast spectacular rice field views from an open-air terrace. 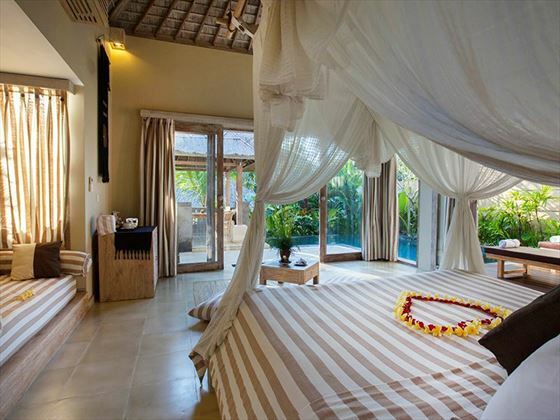 Featuring two beautifully-appointed bedrooms and a living area separated by a glass sliding door, the villa offers a plush four-poster king-size bed and a single bed. 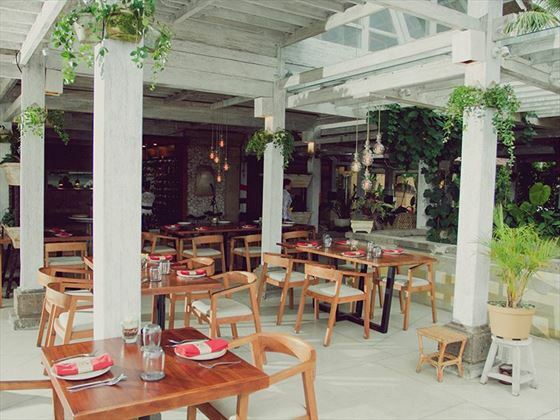 Accommodates up to three adults, or two adults and two children. 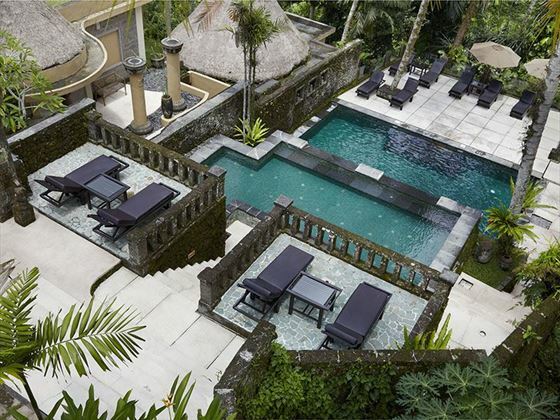 Family Villa with Pool This extravagant 144sqm two-storey family villa features a private pool and expansive terrace overlooking the rice field. On the second level, the master bedroom has a king-size bed and stunning views, whilst the first-floor second bedroom is appointed with twin beds. Accommodates two adults and two children, or up to six guests with two extra beds available. Wapa Villa with Pool This decadent two-storey villa spans over 120sqm of private living space with three bedrooms and two luxurious bathrooms. Showcasing spectacular views over the rice fields from an infinity-edge pool, shower pavilion and expansive private terrace. Accommodates up to six adults. 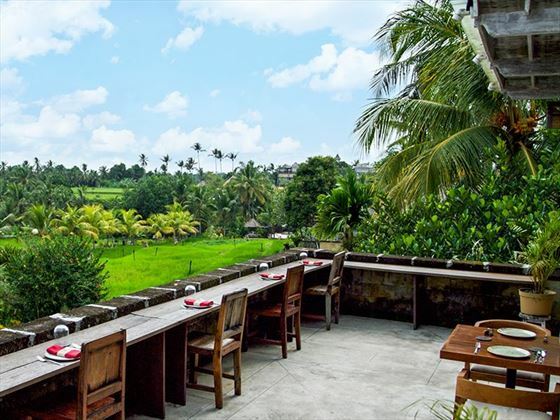 Mr. Wayan Surrounded by the picturesque Ubud rice paddies, this restaurant serves delectable Balinese cuisine using an incredible variety of flavourful spices blended with fresh vegetables, meats and fish. 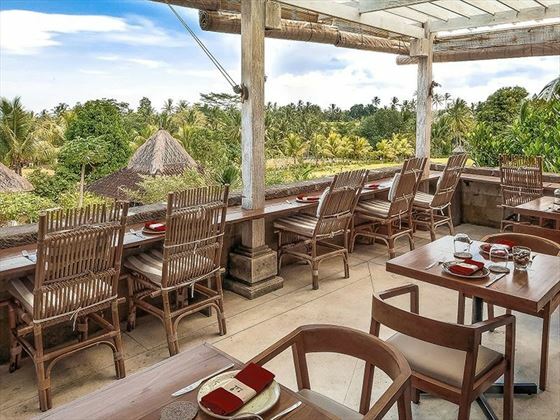 Wapa’s Restaurant Wapa’s offers a wonderful fusion of authentic Balinese specialities and classic western dishes, completed by stunning views of the infinity-edge pool and luscious rainforest. Floating Bale Dining Experience An utterly romantic experience, delight in a gourmet, candlelit dinner for two upon a private floating bale overlooking the picturesque and serene Ubud rice paddies. The Open Stage Dining Experience Dine beneath a star-studded sky beside the rice paddy field at Wapa di Ume’s outdoor open-stage amphitheatre. Starting at 7pm, you will be welcomed with a cocktail before sitting down to enjoy a phenomenal Balinese dance performance and an authentic selection of authentic Balinese dishes created by a team of expert chefs. 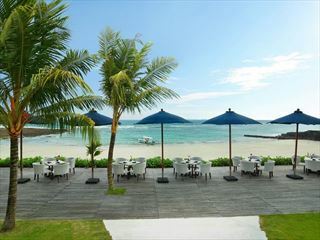 Located on the shores of Nusa Dua, Bali’s prestigious resort enclave, this beachfront resort is a unique sanctuary of exotic beauty and comfort for those who seek a dream holiday.